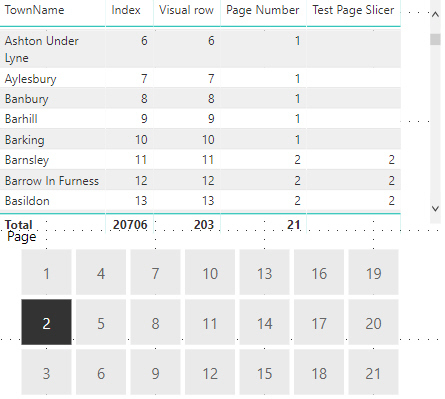 This blog shows how you can split rows in tables into different pages, making the data easier to read. Page 1 of the town sales table. This blog goes through the steps you'll need to follow to create the pagination effect above. The easiest way to work this out is to divide the number of rows in the table by the number of rows you want per page. The Town table has 203 rows, which at 10 rows per page gives 21 pages. Text fields make for a much better looking slicer. That is the easy part done and already you can make the slicer in the above picture. No relationships between the tables are required! In Query Editor go to the Add Column tab and click Index Column. Choose From 1 as From 0 will cause extra problems. This will generate a unique list of numbers 1 to N for each town. Doing it in the query editor means any time the data is reloaded, the index will be redone. The problem with this index (and indeed any calculated column) is that it is static. Adding a filter into the mix (for example, to show only towns in a particular region) will mess up my numbering. ALLSELECTED returns the town table filtered by external sources (such as slicers). 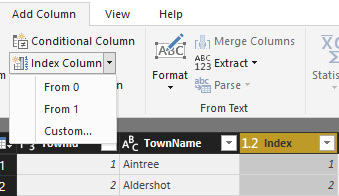 FILTER takes this table and removes any towns which have a higher index number than the current row. CALCULATE then counts how many rows are left in the FILTERED table. On the left is the Town table filtered by external sources (in this case, a region slicer). This table is then filtered to show all Index numbers less than or including Aylesbury (7) (the middle table). The number of towns left are counted and assigned to Aylesbury as its row (4). This gives us a visual row number which will change depending on the filters and slicers used on the table. This will be different depending on how many rows you want per page. I want 10 rows per page, so I divide the row number by 10 and then use CEILING to round up to the first whole number (i.e 0.1 becomes 1). There are currently no filters for this table (hence why the Index and Visual row are the same). In the format section of the slicer under General set Orientation to Horizontal to get this slicer format. The FORMAT function converts the Page Number into text. The formula then checks if this text exists in the Page List table (if anything on the slicer has been checked it will be in the table). 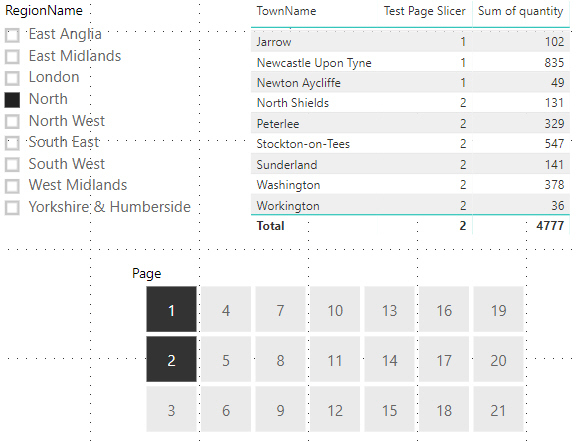 When page 2 in the slicer is ticked, the page numbers in the Test Page Slicer measure are only returned if they are 2. Only rows that were on the ticked pages are returned. As long as a value is returned from Test Page Slicer then we want the sum of quantity. If a value is not returned it hasn't been ticked, therefore we want nothing! These are the sales for towns in the North on pages 1 and 2. Just drag the column width to make it small like you would in Excel. Set Column Headers word wrap to off in the format window. Although I think we can agree that for learning it the other way was easier! Now all you need is an index number in each table you want the pagination in. Also remember to update the Sum of Quantity measure to All in one rather than Test Page Slicer. If you want to see this report click here.